Suggested Usage: As a dietary supplement, take 2-3 capsules each, two to three times a day, or as suggested by a healthcare provider. Pure Ge-132 Organic Germanium is a unique organic germanium compound, bis-carboxyethyl germanium sesquioxide, sometimes called just germanium sesquioxide. It has unique molecular characteristics which make it virtually unreactive in the body, and its small particle size and unique structure permit it to be readily cleared in the urine as the intact molecule. 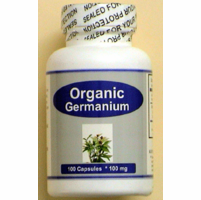 Potentially, the body may use germanium as a cellular oxygenator.